It was with a sense of delighted anticipation that I approached Week One of School Dramafor 2012. This is my fourth year on the program so I have a pretty good idea about what to expect - excited and playful students, curious and passionate teachers and a healthy dose of the unexpected. As a School Drama teaching artist, I work with primary school teachers, teaching them how to use drama strategies to increase their literacy outcomes. I feel quite grown up and a little bit clever when I tell people that's what I do, and here's to that. As an actor, I experience many a feeling in the throes of auditioning, rehearsing, not-working and performing but grown up, clever and useful aren't always high on the list. But once a week for seven weeks, I work in a teacher's classroom in a challenging and satisfying environment that highlights how useful and adaptable the skills I have acquired as an actor actually are. The collaborative nature of the relationship between the teaching artist and class teacher is key to the success of the program and as the weeks progress, the amount of team-teaching increases until the balance flips and the teacher is running more of the session than I am. So it is very much a two-way street, I take my skills in and walk out with much more that I have picked up from the teacher (and students). 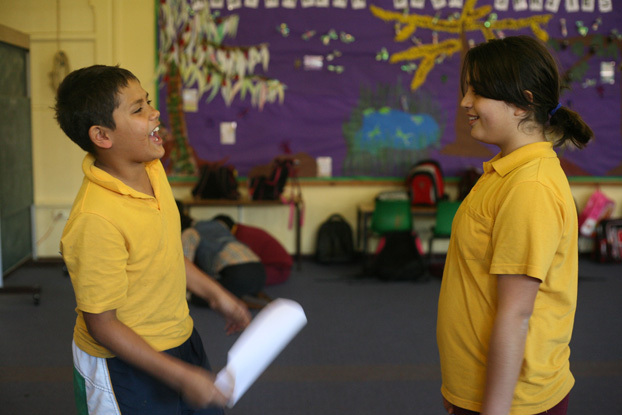 This term, STC has three teaching artists in schools across Sydney; we are working with fourteen teachers in eight primary schools and one Intensive English Centre for teenage students. Our classes are built around a text selected by the teacher and the activities we do are designed to develop skills for the literacy outcome the teacher has nominated for their class. This term, I'm working on narrative writing skills with one class, with a focus on teaching the kids how to show rather than tell, and in other classes I'm working on punctuation and developing characters for narrative writing. Unlike a usual English lesson, the children spend a good portion of the session on their feet - they might be embodying words or emotions, doing a role walk as they develop a character, hot-seating someone from the story we are working on or creating a freeze-frame of a moment in the text. These activities become the stimulus for the writing exercises that they will do between sessions and having walked in the character's shoes, brainstormed descriptions of feelings or watched a classmate take on the role of a character from the story, their minds and pens are loaded and ready to write. The lesson planning takes place in the term prior to the classes and it is at this point that my excitement about the program starts to build. I read and re-read the book, looking for points in the text where we can stop and step into the world of the story. As the lessons progress the story becomes less of a focus and more of a springboard into a world where we can explore how we might feel or react in similar circumstances. I know I've got the sequence right when I read through the lesson plan and start wishing I was in grade four again. And that's where the pleasure of this job lies, we are teaching teachers lasting skills that they can adapt and continue to use with every class they teach but we are also giving groups of students a rich and satisfying experience in the world of words. The range of schools we teach in never fails to reinforce how important rich learning experiences, particularly in literacy, are for all kids. The starting blocks they spring from vary so greatly and the more opportunity they have had to explore the world through story and to develop their capacity to articulate who they are in the world, the better. Georgia is a School Drama teaching artist and one of STC's current group of 18 Artists in Residence.